We only fix what’s broke! Lowery’s Garage services all makes & models both foreign & domestic. But, if you’re looking for a GM expert, this is the place! Our technicians each have over 20 years of experience at a local Cadillac, Buick, and GMC dealer. Our goal is to provide the best quality service at a reasonable price. Every service at Lowery’s Garage includes a complimentary multi-point inspection and battery check. From Oil Changes to Transmissions, we do it all! Fantastic service and fair with pricing as well as helping to know what does and does not need to be done right away , what can wait or just doesn’t need to be done at all . It’s so hard to find a quality reliable honest auto mechanic …thank you John for being just that. They came and picked up my car and did a very good job and came to pick me up when the car was done, and I really appreciate it when I couldn’t take care of it myself. I’ve been taking both of my cars to Lowery’s Garage for about three years now. I can say that each time the service has been top notch and John always finds the problem and provides a remedy. I appreciate his honesty and attention to detail. It’s nice to have a mechanic I can trust. After running over large metal debris in the road, my vehicle sustained a large fuel leak. My vehicle was towed to Lowery’s Garage where I received a prompt call from John informing me that my vehicle had arrived and that after careful inspection, I would require a new fuel tank. John gave me the option of purchasing a brand new fuel tank or a refurbished tank at half the cost. I appreciated that John offered me the two options, especially since opting for a “like new” tank saved me over $700. The work was completed in a timely manner and my vehicle has been running perfectly since replacing the tank. If you are looking for good, honest and great quality work, look no further than Lowery’s Garage! Once again Lowery’s Garage has provided service above and beyond what one would expect. While having our vehicle in for a routine brake pad replacement and oil change, John also replaced an overhead console light that was inoperable and order new knobs for the rear control panel that our puppy chewed off. All costs involved were clearly explained and completed the work in a timely fashion. We were actually quite happy to receive the call that our vehicle was ready before we expected it to be. There are a lot of choices out there for a mechanic but if you are looking for top notch maintenance and customer service, Lowery’s Garage is your place to go! Got my AC serviced super fast friendly and affordable. Replaced worn out seals no extra charge!! I’m very happy, now both my windshield and rear window washers work and my AC is top notch! Thank you John and Brenna! Lowery’s did an excellent job of helping when my truck overheated in the peak of July in Phoenix. They completed all vehicle repairs including new parts and had me back to work the next day. Thanks for helping me Lowery’s. clean and honest shop choose Lowery’s Garage. John got me in on short notice and serviced the a/c quickly and at a very fair price. He and his wife run a fair and honest car repair shop. Highly recommend! My car died while I was at work, I got a jump and took it to Lowery’s. John found that the AC compressor relay was sticking and staying on even when the car was off, causing the battery to drain. He fixed it quickly and for a good price. John and Breanna are so awesome…honest, do what they say they are going to do. Thorough, quality work. Identified problems and worked with us to prioritize them. During repairs, identified additional problems in similar areas being repaired and just charged us the cost of parts for repairing these things. Car is running well, leaks are gone. John is exceptionally knowledgeable about cars, friendly and honest. Great shop, honest people and great rates. Quick turnaround. Would highly recommend and will return if I have any other truck issues. I’m so happy that this shop was recommended to me for car repair. The owners are very involved and knowledgeable. I would highly recommend for any car/truck repair. My experience was overall: wonderful! Honest people & great prices. Repaired exactly what we wanted done at a very fair price with no surprises. They were able to get me in very quickly and completed the work on time. Thank you! We have had the best service from these very knowledgeable people. We are always pleased with the service and honest people. We have had what I think is the best mechanic in all of Phoenix. Would not go anyplace else. They are honest and the nicest people. Can’t beat Lawrey’s Garage for honesty, great service and fair prices. I have become another loyal customer. I had brake repair done today. John estimated it would take a couple hours. It was done in a little over an hour. As always the service was friendly, the estimate accurate and they are always happy to explain and answer any questions. Had an oil change today. Friendly and efficient service as always! This place is the place! Not a long wait for a oil change and I called same day. It wasn’t the typical auto repair, I was not smooth talked into getting anything other than what I went in for. He did suggest a few things for a later time and was not pressing. Best Garage ever!!!! They only fix what’s broken!!!!! There are dishonest auto shops, honest auto shops, good auto shops and in rare instances exceptional auto shops. I am so grateful that I found an exceptional auto shop at Lowery’s Garage on Cave Creek Road. The owners have proven to be extremely honest, knowledgeable and charge very fair prices for the repairs provided.They do not go out of their way to find additional problems with our vehicles. That alone has impressed me. It’s the little things that mean a lot and make a customer feel appreciated. The only problem I have is that their shop is 75% hidden because of a large tree just south of the garage. I have to pay close attention or I’ll drive right past it…small problem for great service. This review is not just for the dodge ram, but I bring all my company vehicles to Lowery’s garage. The dodge happened to be my personal veh. and I brought it to Lowerys because of the service I get with company veh..They go out of their way to insure work is done in a timely manner as I cannot keep a company veh. off line for any length of time. Their work is spot on and at reasonable pricing. Just picked up our truck and extremely pleased. Had a cold start problem and he diagnosed and replaced fuel filter and pump. Very reasonable and always informative and great customer service. We would not take our vehicle anywhere else. Thank you John and Brenna! Great service across the board! Will absolutely be going back for future repairs. John does great work. He is very reasonable. He’s very informative about what need to b done and how and why. Great business great team friendly. Work done in timely manner. Awesome place to get good reasonably work done. And they got free jelly belly beans. Lowery’s did an excellent job servicing my car. They listened to my concerns and were very professional. They did not add unnecessary services to my bill. John is professional and dependable. Did not have to wait long for the oil change either. As always John Lowery does an excellent job!!! Recommend his services for his honesty, good quality and dependability in service. We’ve been looking for a good mechanic for awhile after dealing with the dealerships service department. We were referred to John Lowery by a neighbor. My husband was very pleased with the parts being ordered in a timely manner and the wait time at a minimal while he waited on the vehicle. I think we found our mechanic. We will continue to use Lowery’s Garage for future vehicle repairs. owner went out of his way to accommodate us, found a used part at our request to help us afford the repair. we couldn’t be happier with his cooperation. the job was first class, we highly recommend Lowery’s garage. Quick and honest service. John always takes the time to show and explain what work was needed and performed. Gives me comfort that that he stands by his work. An Honest mechanic with fair prices! Fixed my car at a fraction of the costs of what I expected. They only fix what’s broke! John gave us an idea of what it could before taking a look. Called before work was started. Did a free inspection on rest of car. Very satisfied with ignition coil fix. We have been to this garage on our 2 other vehicles. Recommend on repair, fair pricing and high skill set. Great service from family owned business. Thought it might be time for a new truck. Nope! John can fix anything! Best service in town. Great job fixing my oil leak turned out to be a rear main seal no more problems since then. Great service for a fair price. John, Brenna, and their crew are truly the best. They really mean it when they say they “only fix what’s broke.” I had my van in to get checked out before heading to CA in July; John told me I’d likely need the brakes done at the next oil change. I took it in yesterday for an oil change. He did a brake inspection and said the brakes should be good to go till the next oil change. They’re never trying to make a quick buck from their customers. The honesty and the way they treat their customers like family guarantees that I’ll be back again and again. John worked on our brakes and did an oil job. Walked away knowing the job was done correctly and was not over charged. Will continue to bring our vehicles to John Lowery’s Garage! John and Brenna are so awesome. Always available…even late on a Friday for tow drop off when my husband’s car broke down. John is so knowledgeable and explains what he is able to do to fix your car. I so appreciate going to a garage that I can trust and get good rates at. Thank you Lowery’s Garage for always being there for us! Excellent, trustworthy, convenient and very friendly service. I read the revised from Yelp about this garage and I could not agree more on how they only do exactly what is needed. I have been to many other garages in my area and I am so glad I drove the extra distance. I was expecting the worse but to find out only a couple things were wrong, and the price was perfect. I will definitely be back and my review is completely my own and my own experience. Cannot say enough good things about Lowery’s Garage. John is a top mechanic! Plus, very honest! Had quoted a price and when I picked up my truck, the price was lower due to a warranty that I did not know about. Thank you John for the quick turn around. I went in for an oil change, they were very thorough and efficient as well as timely and pleasant to work with. Great service, great price, great people! John Lowery is one of the most honest mechanics out there! I highly recommend Lowery’s garage to anyone! Great service and they even gave me a ride home after I had to get towed to the garage. John and his staff are always very honest and reliable. Clean shop. Good customer service. Everything explained up front and documented on the invoice. Always good to be able to talk to your mechanic unlike the dealerships. A great shop with a great mechanic. If you’re looking for one of the few mechanics who will be honest, fair, communicate well, and do an excellent job then this is the place to take your car 100%! John and his team at Lowery’s Garage just did a wonderful job on my Golf TDI. There was a leak that required replacement of an axel seal. These guys really know their stuff! Lowery’s garage did a thorough job of replacing all the old original rubber components, hoses, and belts and flushed all fluids and did an inspection of brakes. Now I feel like my 21 year old vehicle will be good to go for years to come. Thanks John! Great job! John quoted me honest pricing back in May for multiple services I needed in for my truck. It took me a couple months to put some money together, but I finally was able to get a few of these services done. I dropped my truck off yesterday at 5:00pm and I was told it would be ready by the time they closed at 2:00pm on Saturday. They stuck right to it! I got a call from Brenna at 10:52am letting me know my truck was ready. It’s too soon to tell if the services (ATF flush & brake fluid exchange) hold up, but I have tons of faith in John and his shop. I plan to bring my truck back soon to get the rest of services that I need finished. John was very helpful with finding the solution to my jeep and helping get it back to me in driving condition once again! Took my work truck in and John was quick to find the problem and did not gouge my wallet. Will be bringing my truck back to him!!! John and his team are the best i would recommend Lowery’s Garage to all my friends. John and Crew at Lowery’s Garage to the rescue once again. I was having some trouble with the Air Conditioner in our 2002 Blazer on one of the hottest months in Phoenix. They got the job done right, for a fair price, and stayed late to get it done the same day. With our busy schedule, that is appreciated beyond words. Had my car towed into shop, no brakes. John weeded out the problem, master cylinder. Gave my a quote, the final price ended up being 100 bucks less then quoted! I love that! Great place. Will come back. I have taken my car to Lowery’s garage since they opened in 2015 and I will never go anywhere else. From changing the oil to replacing the fuel injector, they have provided me with great service at an affordable price. I know I will always get an honest, straightforward diagnosis. You won’t find a more knowledgeable, ethical, capable mechanic – they are the best. They really do stand by their motto, “We only fix what’s broke”. Got an oil change and wasn’t haggled to buy other things, unlike other places do. I replaced new front break pads and new rooters which was substantially cheaper than other places. John is honest and I totally recommend them. They really do stand by their motto, “We only fix what’s broke”. Got an oil change and wasn’t haggled to buy other things, unlike other places do. I replaced new front break pads and new rooters which was substantially cheaper than other places. John is honest and I totally recommend them. We just took our jeep in for ac problems and John got right on it for us. We always take our Cadillac Escalade for any needs and Lowerys have done excellent work as well as being very honest with the jobs they do. I would recommend them for any vehicle you have. John Lowery is a trusted mechanic, efficient and reliable. It is not often you can walk away knowing that the work was completed correctly and you were not gouged in cost. Thank you John, you are awesome!!! I will continue to bring my vehicles to you!!! John did a great job on my car and runs an honest shop. He only does the work required and never tries to pressure you into other work. I would recommend his shop to everyone! And he was fast! Great customer service. Took care of my issues. I would recommend them to anyone. Our A/C DIED – WE WENT TO LOWERY’S AND THEY TOLD US IT JUST NEEDED A BLOWER MOTOR . $152.00 PARTS /LABOR. THEIR PROMISE IS TO ONLY FIX WHAT IS BROKEN . THEY ARE HONEST/RELIABLE AND A JOY TO WORK WITH. HIGHLY RECOMMEND. The Staff is really good. They honestly told me what the problem was and fixed it and even explained about how they fixed it. They did a courtesy check on all fluid levels as well. they only fix what is truly broken. After the experience with going to the dealer, this place is refreshing. They are not open on Sat. so plan accordingly. Service is great, accurate and friendly. For two years the service has always been reliable, fare and quick turn around. Communication is great and I’m not that knowledgeable about car repair. I’ve also made several recommendation to other friends who all have the same positive experience. Friendly,low-key individuals who took time to discuss any problems that I as owner felt were pertinent and then spent time with directed questions about car performance to better their understandings! Came out to advise me of diagnoses which were then repaired/fixed. Very comfortable with entire visit. Confirmed my referral by a friend. Friendly,low-key individuals who took time to discuss any problems that I as owner felt were pertinent and then spent time with directed questions about car performance to better their understandings! Came out to advise me of diagnoses which were then repaired/fixed. Very comfortable with entire visit. Confirmed my referral by a friend. good prices on parts labor was fair, and runs great. Fantastic service and my truck has never run better. I thought the sounds were just my truck getting older but it was so lound and annoying that I brought it in. Amazing job and now I feel like I’m driving a new truck! Great place to have service done at. They tell you everything you need and nothing you don’t. They are up front with you about time and price. I highly reccomend using this place for your next car repair or matainence. Prompt, friendly service. They seem to be quite busy, so get in early if you can. Good to see a local shop doing well. First time customer, great expectations, great results. Referred to Johnny and his staff by my nephew who said that I wouldn’t be disappointed. Nuff said! Fixed my daughters stalling car and now I have piece of mind knowing that she is safe up in Flagstaff! Thanks! Took in for routine maintenance. They found two small issues and gave me estimates for repairs. Great shop, priced responsible and excellent service. Will definitely be returning for all future repairs and maintenance. 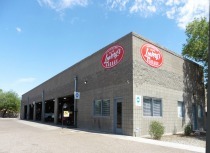 The best place in Phoenix to get you car repaired. Honest, fair and reasonable. Motto of, “we only fix what is broke” aptly apply to this shop. Owner/chief mechanic John does not pressure clients to have something fix, as a matter of fact will correct something with no extra charge in the process of fixing a car issue. They always take good care of me (my vehicle) at Lowery’s. They take the time to explain what has been addressed, what may need to be addressed, and always give great service. John is the best. Great service and fair prices. We now take all of our vehicles to Lowrey’s Garage for service. Best service, best price. We take all of our vehicles to John. Ford, Honda, Toyota and Scion. He can do it all. Best service ever! They did the job at a fair price and on-time. It’s hard to find people you can trust in this business, but John and Brenna make me confident about coming back. The garage and service is great, John really knows what he is doing and does not over price on anything. He also let’s you know what else is wrong with your vehicle so down the road you don’t have any surprises. Service was excellent, very professional and thorough. Definitely recommend if in need of a good mechanic. There’s nobody else that I would trust with my vehicle! This is the 3rd car I have owned and John is the only mechanic I ever have gone to! He is straight forward, quick, and knowledgeable! I found Lowery’s through Yelp after I was searching for a reliable and honest mechanic that could just inspect my truck and tell me what services it really needs. I got an oil change done at Valvoline and they told me what they thought I needed, but I wanted to have that confirmed by a reliable mechanic. I noticed John specialized in GM vehicles, which made me even more interested in bringing my truck to him. I scheduled an appointment and he stuck to it. In an hour, he thoroughly inspected my truck and diagnosed everything I would need done, as well as quoted me pricing for those services. Not only were his prices super competitive and honest, but he didn’t BS me and try to upsell me services I didn’t need. I appreciated his honesty and I will be bringing my truck to him for my services. The A/C stopped working in my company truck. Not something I want to be without with temperatures rising. John had everything taken care of in less than a day, and for a lot less money than I expected. John was great. Very accommodating and up front about pricing – how much oil and filter change would cost for full synthetic. Very personable too! Recommend without hesitation. Support local businesses! Excellent service, excellent prices, excellent customer service. No pressure, no scare tactics. Awesome service. Had my truck back with OE parts in a day. Fair price and easy to get an appointment. Will be back for all my future service needs. We have taken our vehicle here for maintenance as well as repair. The vehicle is repaired quickly, correctly, and at a great value. John has always been fair and honest. He also has over 20 years experience. Highly recommend his work and service. Awesome service as always! Even showed my teenager the basics of car maintenance! Great value , very fair pricing . This is how you build a business . John , thanks . Any need from a simple oil change to a needed repair , i will take my vehicles to Lowery’s . Previous shop told me clutch was going out but they were unable to fix and recommended dealership. I also had a noise in the back of car. I thought it might be the brakes. Previous shop said they cleaned brakes and they were “fine”. John checked my car and clutch was going out and he was able to repair it. He did an awesome job and explained repair. He check my brakes as well and the left rear pad was totally worn down and the right rear was not far behind. He repaired the brakes and showed me the pads. It was actually a safety hazard. My car is now in tip -top shape. It is running great and no more irritating scraping noise. They are very friendly and helpful. I will be taking my car to his shop from now on. Thanks!! for a great job. I trust no one else with my vehicle! John is the best! Honestly the best service ever; I brought my car in for new break pads and John and his wife had it in and out in less than two hours! I will definitely come back if I need anything else. Great service at a great price. John stopped what he was doing and got my truck in and out in a timely manner as I was waiting. Great Service, Fast, & Great Customer Service! The guys at Lowery’s did an excellent job getting a 1949 Buick I found sitting in a field, back on the road. It now runs, drives and stops like it did in 1949! The brakes on my Malibu were just serviced less than 6 months ago by a competitor of Lowery’s Garage. They have been squealing for awhile now but functioning fine. When I would come to a stop it sounded like several pigs had been run over. I took it back to the repair facility who insisted I must park were water can get on them and warp them. Nothing they can do. My fault!!!! So I took it to Lowery’s Garage and was told that the cheapest quality pads were used and that’s the result. So Lowery’s put AC Delco pads on it and charged me less than I paid the competitor. If I had asked for cheap quality I wouldn’t complain, but I didn’t was lead to believe I got quality!! John at Lowery’s Garage will have my business from now on. Thank you for being Honest and Fair. Great service as always. Clear explanation of services performed, quick turnaround, friendly staff. I bring all my vehicles to Lowery’s and all my family members go there as well. I highly recommend John Lowery at Lowery’s Garage. I was able to get next day service. The service is always friendly, professional and thorough. I appreciate the heads up of future recommendations he provides. It feels good to have a local mechanic that you can trust. Called John first to make sure he would be available to fix the air conditioning. Left the truck and received a call regarding what was wrong with the air. Had it fixed by the end of the day and I am a happy person with the super service I received. Cannot say enough good about John and his shop. Will go back as needed. Very impressed with the knowledge they had of my vehicle and the service I received. They explained to me what they did and showed me the parts that they replaced. They were finished within the time line they gave me and were very professional. I will definitely make Lowery’s my repair shop from now on. Great and speedy service. I just needed the oil change service this visit and an overall inspection. I recommend Lowery’s Garage to family and friends. Trusted diagnosis, fast repair and he only fixes what needs to be done and gives an honest analysis of condition and needs for future concern. We were given the highest recommendation from a friend and have been ever so grateful for that recommendation and recommend this garage and John Lowery for all your vehicle service needs. This was the second time we took a vehicle to John at Lowery’s Garage in Phoenix. The first time we had a vehicle we had taken into a nearby shop and felt we needed a second opinion. After doing so and feeling confident with John’s diagnosis, we had him do the work. It saved us at least $2,000. The other shop had mis-diagnosed the problem. With John’s experience, we were very thankful that we made that choice to visit his shop. The second time in was for a maintenance on another vehicle. We like how they give us detailed information on what would be done and cost. We feel we can believe what they are saying and won’t try to fix things that don’t need to be. Their shop is also well maintained/clean. We will continue to take our vehicles there and we’re glad we found a shop we can trust. Once again, John delivered top notch service. With HONEST and fair prices you won’t be disappointed. I go out of my way to have John work on my car! He finds and addresses the car’s most urgent pains. I couldnt be happier .. I had a problem with my car this morning and lowerys garage was able to get car to the shop figure out the problem and fix it and i have my baby back all in one day .. Thank you everyone for all you quality work. Fast and reliable service combined with great communication and step by step updates. Always in good hands at Lowrey’s Garage. I am a repeat customer and once again I come away feeling I received the right service for the problem I had. John communicated the issue with my air conditioner well and kept me updated me on the timeline for repairs. I will certainly return for my next service need. The owners are very friendly and do there best to repair any issue with your car. Lowery’s Garage is the best, We recommend them highly! Great service, friendly and quick. This place was absolutely amazing. John took my car in and kept me updated along the way. They were super nice and the service was really fast. I am so thankful that they were able to fix my car that day and get me back on the road. I will be bringing my car back to them again!! John and his staff are the best, gave us a bid and got the job done very quickly and under the amount quoted. Fixed only what was needed. They are honest, reasonable, friendly. I will be recommending Lowery’s Garage to all of my friends and family. Went in to get my a/c checked. Had quick and great results. The shop was clean and well kept. The staff was very helpful to guide me through my concern. Lowery’s Garage provided an outstanding experience. The owner and his team are extremely knowledgable, very friendly, and offered an very competive price to fix my truck. As a female it is refreshing to find a mechanic who treated me with respect and explained the issues with my vehicle in a way that I didn’t feel talked down to or pressured! Thank you…you have definitely found a loyal client! This shop had been recommended to me and I’m so glad they were. Got the air in my truck working as it should and the cost was very reasonable. I will return if the need arises. I don’t know much about cars, so my experiences have always been iffy at car shops that i went to, leaving me with a suspicious feeling at the end. BUT ALL THAT CHANGED once I was recommended to Lowery’s Garage…John and his team are honest, knowledgeable, hardworking and reasonable. Bringing your attention to what needs to be fixed and why! And at the end of the day your left with a feeling of being taken care of. I’ve found my new car shop, and I am quick to recommend them. Tell them Aaron sent you! John Lowery is awesome! Honest, hard working and reasonable. He will tell you the truth about your car and give you options to fix it! John takes pride in his work and in taking care of his customers. All my family trusts him and we all have our cars serviced by him. His shop is worth the drive! I think I have found my new repair shop. They can work on most cars and trucks. I have both and will be taking them to this shop. John the owner and his wife are awesome. I dont know much about cars and I always feel like I am being ripped off. This shop made me feel comfortable and was explained exactly what was going on. Try this place out. I know you wont be disappointed. John and his team found problems on my excursion, that other mechanics could not find. His team did the best on my vehicle. Worked on what i needed and wanted done . Returned the excursion before i started school. I am very happy with their customer service and product. Brenna and John helped me financially and mechanically understand the situation. A trustworthy garage that i will continue to use for years to come. Very nice people and great service. I love Lowery’s Garage! Great prices and customer service. I come here for my oil changes and anything else that goes awry. They’re right when they say, they only fix what’s broke. A shot out to Lowerys Garage for a great job on repairing my vehicle. Always willing to take it at a moments notice and complete the repair in a timely manner and a fair price. I trust him fully with all my vehicles and you can too!!!!!!! John Lowery and his team are top notch! I called that morning and got in that day with a great turnaround time and efficient and professional customer service by all involved. I highly recommend this garage, John’ experience and effectiveness is great!! Thank you for taking such good care of us John and Brenna! If I can’t or don’t want to fix it myself, this is the only place I will take my vehicals. Great service, awesome people, great prices. I’ve done John for quite some years now and know he’s an honest, highly skilled technician. I take my car for all service needs to Lowery’s Garage. Great service, quality workmanship, and cost-effective. I had a brake job and a general service performed by John. Then I asked him to do a general inspection of the whole vehicle in preparation for going back to the dealership for repair under the warrantee. John found some important items needing to be fixed That I doubt that the big dealership would have found, saving me big dollars had they gone out after the warrantee was over. What a great asset to have for us. John has established his shop recently after many years working for an established auto dealership. I have found his work to be accurate and his prices very fair. There are two things that you want to find in a mechanics shop. The first one is experience that can eliminate the guessing game and costly misdiagnosis. The very next one is honesty. I have been able to find both in Lowery’s Garage. Tank you and keep up the great work! We are beyond pleased with the service from Lowery’s Garage. John Lowery is an honest, good quality mechanic (which is impossible to find). He found what what wrong with our truck and fixed it at a VERY reasonable price! We have recommended Lowery’s Garage to family and friends who have also been completely satisfied with the service. John’s wife Brenna runs the office and is extremely friendly and gave superb customer service! We will continue to use Lowery’s Garage and will highly recommend them to everyone!! Awesome place to take your car for repairs ,they were able to work with my budget and repaired it same day. I’ve had nightmare service at dealerships and other local garages. I never thought is was because I am a woman but..?.I am so impressed with John Lowery’s garage. John not only is a great mechanic, he actually cares that I understand what he did to my car to fix the problem. It’s not just about the money with him, its old fashion customer service and integrity. Lowery Garage has my business and I live 40 minutes away from the garage! Great Shop! Always correct diagnosis and fixes right the first time.Top Quality. We took our truck in for a/c and ABS Control Module repair. There is always fear when you have to go to a repair shop between labor and parts it can be out of control. John Lowery is honest and will repair without gouging someone’s pocket when it is not necessary. I trust and recommend Lowery’s Garage. Thanks John!! Excellent and fast service, not to mention inexpensive! They did my alignment for $60! That’s cheaper than anywhere else I can find. I highly recommend! My best friend recommended Lowery’s to me. I’ve had two things done so far first a torque strut mount replaced and now just the regular oil/spark plug change. John is very professional and always does great work! He has great customer service. I will recommend him to anyone who needs mechanic work done. I also so love that they do a full inspection of the car and check all fluids and air pressure in the tires. And let me know about things that need attention. Which lucky hasn’t been anything to major. I will keep coming because of the great work, pricing and of course the great customer service and honesty! This is where you want to go if you want great service by honest people. John and Brenna Lowery have created the best garage in the valley. The lobby is a comfortable room that is welcoming to anyone who walks through the door. John will not “fix” anything that is not broke, and he is always upfront about the current and possible future condition of your vehicle. At close to 30 years in the business John is truly a master at his trade and will give you the best quality service at a great price. As a female who knows little about the mechanics of a vehicle, I know that I am being taken care of by honest, good people in a comfortable environment. This is a Great shop, did what they said the would do in the time i asked. Very friendly with a great service. Thank for your searching for auto repair service in Phoenix, AZ, and Tucson, AZ, areas. We are pleased you've chosen GarageFly to help you with your automotive repair needs. Lowery’s Garage is one of GarageFly's many user rated and reviewed auto repair shops in the Phoenix, AZ, and Tucson, AZ, areas. There are so many choices for automobile repair in Arizona; we feel it's important for you to be well informed. Please visit http://www.lowerysgarage.com/home.html for more information about this automobile repair shop's services.